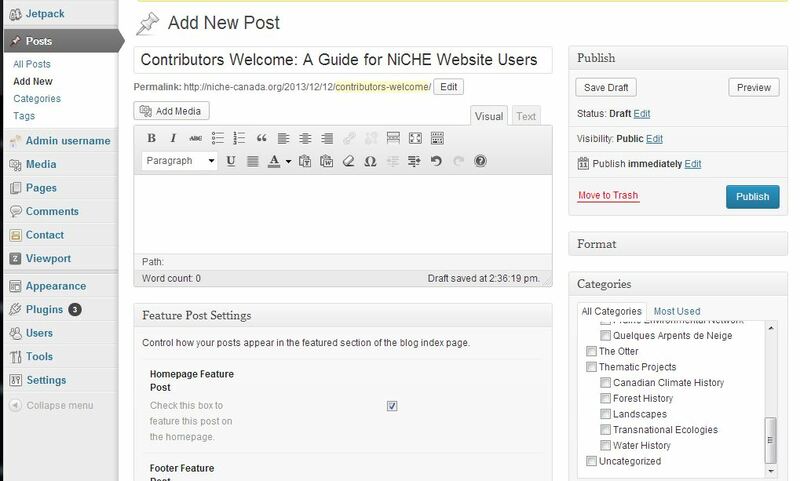 Wordpress simplifies contributing to the NiCHE website. geography — it just makes it easier! The new site is easier to use, easier to maintain, and more mobile-friendly. For all the old site could do, you probably never spent much time reading The Otter on your mobile device, and you wouldn’t have dared try to upload a comment from one. The new theme features large high-resolution images for each post and in the carousel on the front page, and it is well-suited for displaying video and audio content such as Nature’s Past or EHTV. We have had to sacrifice some features in the move to a WordPress platform, but over the long run this site will be better for the network and good for environmental history. As usual, everyone from the NiCHE community is invited to contribute to the website, and we have prepared a complete guide tailored for NiCHE website users (see PDF below). We hope you will register or renew your account and join the conversation about critical issues in Canadian history & environment. Anyone who has registered for an account on the NiCHE website (either on the old site or the new one launched in October 2013) is now able to contribute material such as blog posts, audio/video media, deadlines, and events. The original welcome post described how to set up an account or use your username or email to reactivate your account. Basically go to niche-canada.org/wp-admin and click on ‘lost password’, enter your old username or the email you used to set it up, and then click ‘get new password.’ You’ll find a link to reset your password in your inbox. If you encounter any problems or inconsistencies please use the NiCHE contact form to contact the website administrators (at this point that goes to yours truly).